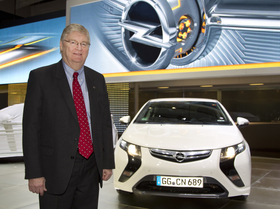 Opel CEO Reilly's green strategy includes the launch of the Ampera extended-range hatchback, shown. BILBAO, Spain -- Europe must gain the technological lead in electric mobility or Asian rivals will "take the market," General Motors Europe President Nick Reilly said. The speed in which Asia is moving up on battery and other technology is "amazing," Reilly, a former head of General Motors Co.'s international operations in Shanghai, told the Automotive News Europe Congress here. "We must not miss that boat and allow Asian manufacturers to enjoy our market opportunities," said Reilly, who is also CEO of Opel/Vauxhall. He said most international studies project the eventual disappearance of combustion engines and their replacement by electric motors. Some forecasts expect the electric car to be a mass product within 10 years. "During my years spent in Korea and China, I've come to admire the intellectual curiosity, the studiousness and the dedication of Asians," Reilly said. "China invests billions in the development of electric cars, battery technology and other alternative energy, leading to significant technology advancements and a rapid decrease in unit costs." Reilly said European legislators could help the region's automakers by harmonizing green taxation and incentives and ending multiple technical specifications and requirements in the 27 EU member states. "Europe will also need unprecedented technological breakthroughs and major investments. It will be even more important to balance out environmental, social and competitiveness objectives," he told the Congress. "There is a massive shift of economic power to the East, and Europe must not be complacent. This means that we need to accept that more flexibility and hard work is required and that we need to be on the forefront of relevant education and r&d innovation," he said. Reilly said Opel is recruiting 250 new engineers for its technical development center in Ruesselsheim, Germany, but it was not that easy to find enough qualified engineers. "This shortage is a concern for many companies. We need to encourage the young to pursue their education in the fields of engineering and the sciences. For that they need viable and interesting job prospects," he said. Opel plans to pump 1 billion euros from its five-year 11-billion euro investment plan into innovative and fuel-efficient powertrain technology. "The introduction of a range of what you could call 'green' products is an integral part of our turnaround strategy," Reilly said. Opel's “e-mobility-unlimited” strategy encompasses small battery electric cars for people who drive short distances in cities, extended-range electric vehicles for people who need a car to cover both long and short distances and hydrogen fuel cell electric vehicles. "By 2012, 80 percent of our carlines will be three years old or less. In 2010 alone, this includes seven major launches and in 2011 we plan another five launches, most notably the extended-range electric vehicle Ampera, an industry-first in Europe," Reilly said.